Read your review about Tekton Enzo speakers in TNT-Audio. I was wondering if you felt Tektons monitors would be a good match for a NAD 3020 series 20 amp? Thanks for your email. The NAD 3020 certainly is a classic design worthy of a good speaker. I have not personally heard Mini Lore monitor but I have heard the heard the Mini Lore tower and was favorably impressed. Based on my that and the stats available for the monitor, I feel confident it would be a GREAT match with the 3020, regardless of the type of music you like. Let me know what you decide. I have read your article regarding the Atacama Nexus stands and you mentioned the solid welded aluminum rigid stands are your preference, comparing to the bolted designs. I am a bit confused because I was thinking that the rigid compact designs will vibrate more and the stand alone will became an integral part of the speaker itself. It seems we are increasing the problem. Do you agree with this idea? I am doing some speaker stands from metal and I am using some O-rings between the plates and the metal colums to partially stop the vibrations and try to minimize it with the spikes finally. On the other hand, what do you suggest to testing the stands? Our ears or using technological equipments. I appreciate your comments which will be a valuable guidance for me. when it comes to speakers stands different and alternative approaches might be equally good. You can use stiff and light stands, which resonate at higher frequencies and let all the energy of the vibration pass through or use some heavily damped design, that resonates at lower frequencies and absorbs most of the energy it receives. The final result also depends on the weight of the speaker you are going to use. Mathematically, the problem is modelled by a simple application of the mass-spring model, the mass being the speaker and the spring being the stand. You can even use a stiff stand and then couple it to the floor via soft rubber dampers. It's mostly a trial and error procedure, you have to judge by ear because there are too many variables involved...and one of these is your personal taste and the kind of tonal balance you wish to achieve. For example, if the sound is thin and sterile, some damping might add body to the whole sonic performance. On the other hand, if the sound is wooly and lifeless, some spike and rigid coupling might be beneficial. And don't forget the monumental, nine-parts, series of articles by Mark Wheeler on vibration control devices! I read your review about the SKT In The Groove Record Cleaner. As I have years of experience with this kind of record cleaner I should add that normal water is not quite suitable for cleaning the Cleaner surface because it contains a more or less big amount of minerals which block the cleaning effect of the sticky surface after a while so that it loose its stickyness. That's why I recommend (double) distilled water and (after some weeks of use) a mixture of distilled water and isopropanol. Thank you for your input. I noticed it was getting a little less effective after several months. I will pass on your comments. Sorry my Italian is quiet limited, if I well understood you are Italian! I am a neighbor as a French blogger living in Paris, please see my blog available in french and english about French HIFI products. I have just read your article from November 2012 about PS Audio which is developing a great direct sale program with a great value for the consumer as test home before buying. The PS audio example is great, but would you have other examples for dealers? A number of consumers here are lost about digital music solutions and to make a choice of the different hifi component, they look for simple and valued package with speakers amp and sources in the box. I have number of my readers who are looking for such dealers with an offer "test home before buy" but for full stereo systems. other HiFi Companies offer the same test before you buy formula but, as far as I know, it is hard to find someone who lets you test a complete stereo system at home! Some dealer might offer this possibility, eventually after an adequate cash deposit, especially if the sums involved are high. For budget systems it is much more difficult because dealers might have to do with paranoic timewasting audiophiles who just want to test everything and then buy nothing (or buy online where the price is lower). I experimented with speaker positioning from the rear wall (used the Cardas rule as an approximation) and in the new position where the speakers are pulled out - I am managing much better communication between the speakers, the soundstage is there, the width and imaging is felt. The Epos M12i are fairly large standmounts so they don't exactly disappear but it is so much better now - the interference from the TV on the rear is reduced (though not eliminated - that's a compromise I have to live with). Had an inteersting observation...the width of my rear wall is 12.75 feet as per Cardas speaker placement, the distance from the side wall worked to 3.5 ft and the distance between the 2 speakers (center of the midbass driver) worked to 5.75 feet. With a bit of toe in and some adjustment, I am managing to get a good centering (so as not to split the handshake between the 2 speakers) at aspeaker - speaker distance of about 6.1 ft. Observation - in order to get even better handshake between the speakers, I had to pull them forward by 1.75 meters as they were imaging against the brown rack and not against the rear red wall !! 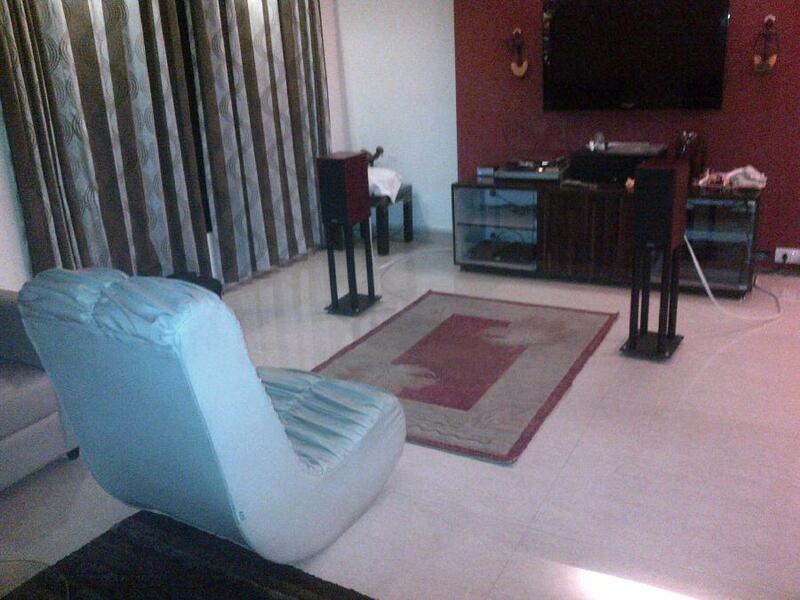 Whenever the home audition happens, I will be placing the above speakers and experimenting with them a bit. I realize, smaller drivers will be placed a bit closer to the wall and vice versa. I think I am getting the drift. The Epos M12i are not going anywhewre but I am very curious to hear the above 4 speakers. They seem to be the best standmounts out there. Comments / observations welcome. 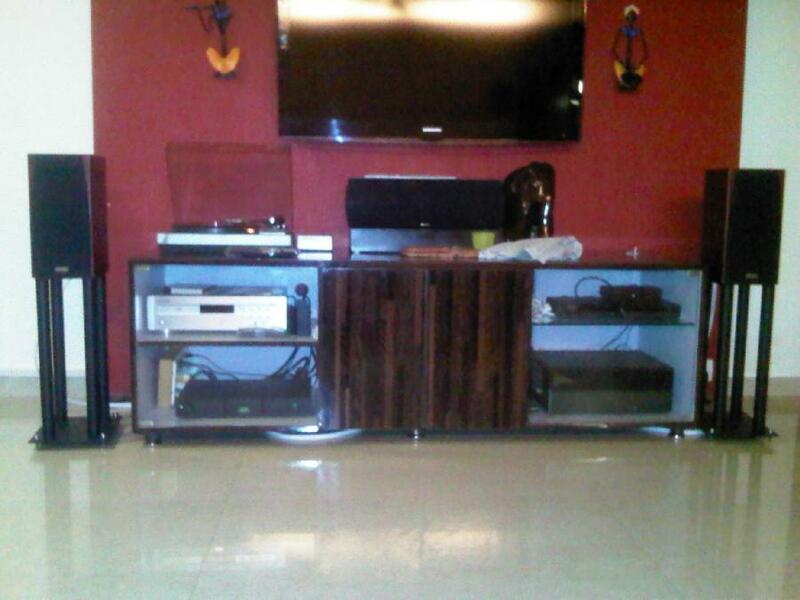 yes, in terms of 3D imaging, the rack behind the speakers is a big trouble, but even the TV and the center channel speaker have negative effects on sound quality. The center channel speaker resonates even if it's disconnected. Try moving it to another room. Moreover, the room seems mostly empty (i.e. acoustically reflecting!) and the carpet between the listening seat and the speakers is definitely too small. I'm curious to know your impressions on the speakers you are going to compare. I'm pretty sure you'll learn that room acoustics and correct speakers placement are of paramount importance: they can influence the sound of your system more, MUCH MORE, than the components you use. Found your review of the above gear.. Do you think the following will work? Use the system as you describe, but instead of plugging the USB B into a DAC, use a USB B to Female A adaptor and then plug in my Meridian Explorer (ME) DAC/AMP into that adaptor. (the ME has a Male A from the computer, to a mini B into the ME). Right now I am doing this, Iphone w IOS7 into cck via USB A to a usb hub. an external battery pack is also plugged into the hub, and then the Meridian Explorer is plugged into the hub. This way I can play flac files from my iphone into the ME. The ME gets its 5v from the external battery. I would consider using the KingRex y cable and their external battery pack to clean up this signal path. I'm not sure exactly how a USB hub is wired but I guess the 5v from your battery pack must be getting through OK if the ME DAC works. If I understand your question correctly, you are asking if using the KingRex UArty lead will provide a significant improvement. If that is so then I would suggest first purchasing a USB 'Y' cable off Ebay that has the mini B plug. I've found one on Ebay for under three pounds. If that does make a difference, then a better cable may be better again (but not by much!). If you have been a regular reader of TNT, you will also have seen my review of the less expensive (but equally good) iFi Gemini cable, and our DIY cable, the TNT 221 that is easy to make and could be made with a mini B plug. If you can't make one yourself, it shouldn't be difficult to find somebody who can. Of course you can use an adaptor if you purchase a lead with a standard type B plug. For what it's worth, I have consistently preferred a good mains power supply instead of a battery pack. I would certainly put my money into something like a Paul Hynes PSU rather than the price of a UArty cable. I'm currently assessing another USB power supply system using the Astin Trew 'Never Connected' system and that is worth looking at too although more expensive than the PH supply. I hope this helps you. I'm also presuming that you are not playing MP3 files from your iPhone. Very interesting topic in TNT Audio (TNT 221 DIY USB cable)! Please forgive me if my question makes no sense but I was wondering why a USB port in a DAC can't just receive DATA and GND from the source (eg my MAC Mini) and 5v from the DAC itself? A DAC like MSB should be able to provide a clean 5v power to its USB port and we could use USB cables without the red line. What is wrong in my assumption? If your DAC does NOT have it's own internal power supply, it WILL take both data and 5v power from the host computer. That's when a Y-lead and separate 5v PSU will help. It looks as though your MSB DAC has its own internal power supply so a Y-lead is not required. Could you please explain - wich type of sand is the best? Why do you advise to use "river" but not "beach" sand? What do you think about this sand? - it's granat sand for water jet cutting, very hard and very sharp. Could you please send me more information - how to build the best anti vibration sand stand for turntable? I suggest river sand instead of beach sand because the former is purer and does not contain salt, which might damage certain materials. The waterjet stuff you mention seems ideal, actually. In any case, even beach sand will work well, provided you wash and dry it accurately.